So, the fossil of the day will be a Jurassic belemnite from the top bed of the Zohar Formation. These are among the simplest of fossils (basically a calcite dart) but they are remnants of sophisticated cephalopods which are relatives of the modern squid. The fossil belemnite “guard” acted as a stiffening and weighting device inside the soft body. 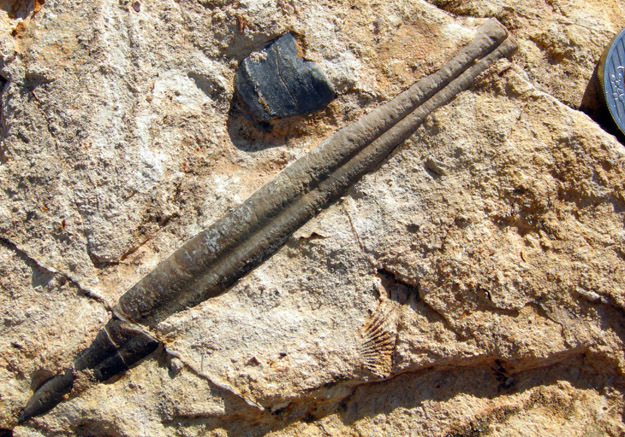 Belemnite from the Jurassic Zohar Formation near Neve Atif, The Golan. Note sliver of coin on the right for scale.